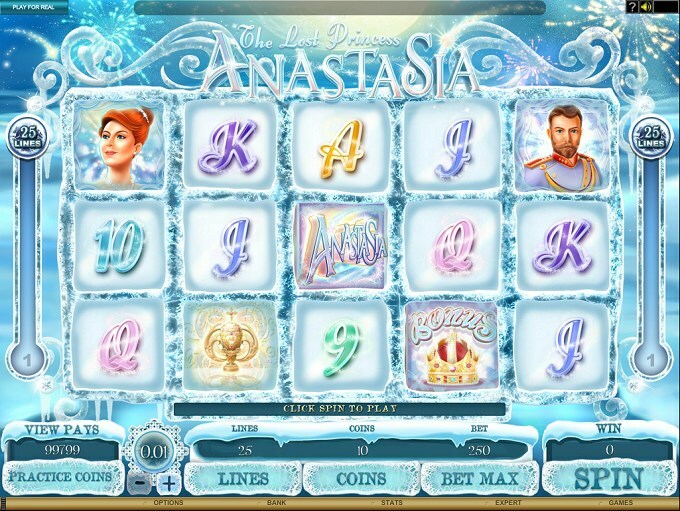 The Lost Princess Anastasia is a game designed by Microgaming, which is themed around a Russian princess that supposedly escaped execution at the hands of the Bolsheviks, when they overthrew the Imperial family and killed them, in 1918. 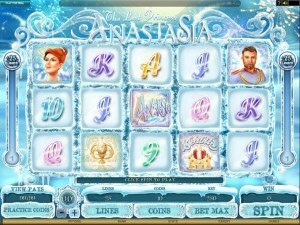 Besides Anastasia, the story includes characters like her father, Tsar Nicholas II, and Rasputin. It doesn’t look like a tragic story in this case though, the design reminding me of a fairy tale setting. 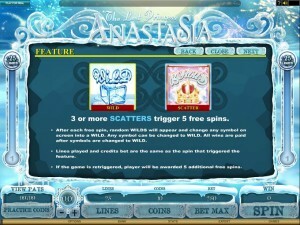 A 5 reel game, it offers a maximum of 25 win lines and a mix of free spins, random and regular wilds, plus scatters. The biggest prize is worth $4,000. 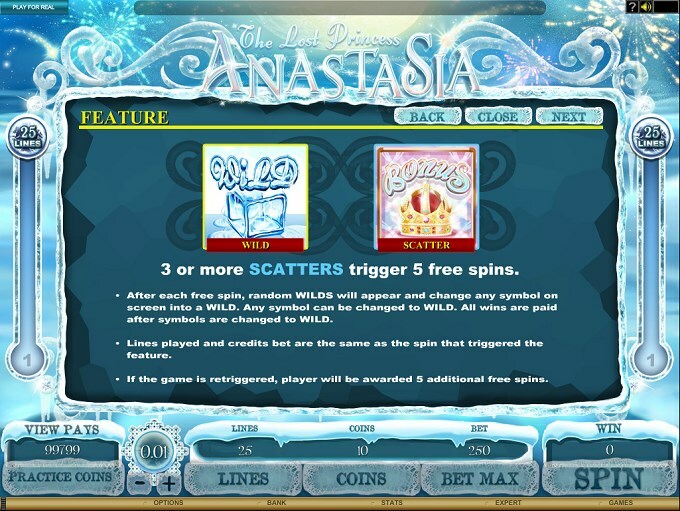 The game has as features a wild symbol, a scatter and free spins which have their own wild feature to take advantage of. The wild symbol is the one that has the Anastasia Logo on it. Since it’s the wild, the symbol is capable of replacing other symbols in newly formed combinations, substituting for another one that is missing if it lands in the exact spot where it’s needed. The wild can also create combinations directly, using multiple wilds found on the same line. The top jackpot of 2,000x is actually awarded this way. The other symbol with a big role would be the scatter Crown. This symbol has the ability to form its own combinations without appearing on a certain payline. All you need is for it to appear enough times on the reels, even if the symbols don’t occupy a line. Payouts vary between 5x and 50x the bet. Whenever a minimum of three Crowns are scattered on the reels, you’re going to get 5 free spins out of it, in addition to the cash prizes I mentioned above. These free spins get random wilds which appear at the end of the round. This gives you a second chance at some wins. Retriggering the free spins will add another 5 free rounds to the feature. The number of coins usable on one line is bigger than the denomination allowed for them. 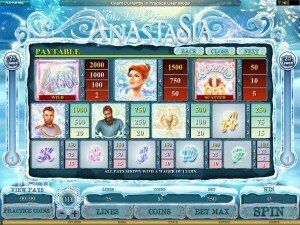 The coin value is between $0.01 and $0.10, with up to 20 coins wagered on each active line. With 25 lines available, the game has top wagers of $50. The wild Logo is the one responsible for the biggest prize, of $4,000, the equivalent of 2,000x the line bet, or 40,000 coins. Calling the design as something fit for a fairy tale is no exaggeration. With lots of ice and snow in it, it uses the former as a material for beautifully shaped decorations. There are fireworks in the distance as well. Even the symbols are very well done, especially those that are themed. The playing cards look OK, though I would’ve preferred something related to the topic. Symbols: Game Logo (wild, 2,000x), Bonus Crown (50x the bet, scatter), Anastasia (1,500x), Tsar Nicholas II (1,000x), Rasputin (750x), Faberge Egg (500x), Ace (250x), King (150x), Queen (150x), Jack (150x), 10 (100x) and 9 (100x). The fairy tale theme and beautiful design will make it a good choice for some, but others will want to skip it because of the low value prizes and the rather average features. You will find The Lost Princess Anastasia at any online casino which chooses to use software from Microgaming, playable either for free or for real money.